Fenugreek (Methi) seeds provide a tangy flavor and powerful curry scent to the vegetable and lentil dishes. Fenugreek seed are used in wide range of curry powder. Fenugreek can also be used as a fresh herb. Fenugreek are always roasted before using. Light roast gives a mellow flavor and dark roast will give a bitter. Sometimes the seeds are soaked overnight, when they becomes easier to combine in curry paste. Soaked seeds can also be used as main ingredient for a vegetable or chutney. Fenugreek are used and grown throughout the South Asia. The Fenugreek plant grows 2 feet tall with light green leaves and white flower. Each Fenugreek pod gives from 10 to 20 seeds. 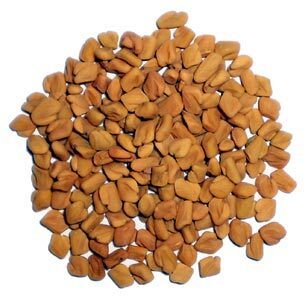 Fenugreeks are rich in protein, vitamins and minerals.